It's a nice idea from Samsung, but this should be a premium product with an amazing screen and design if it's to replace a laptop, which is surely the goal. What's Samsung up to here? It's a tablet that's sort of a TV that you can move except it's not a TV as you can't watch TV on it so it's a tablet but who has a tablet this big? That's pretty much my thought process on the Samsung Galaxy View, a tablet that somehow seems to try and be two things and is neither. The 18.4-inch View is designed to be carted all around the house and let you watch all manner of content if someone is monopolising the main TV. It's not the worst idea in the world - after all, we're doing it already with our smartphones and tablets all over the place, so why not make something dedicated to the task? There are more than a few issues here though. There's no high-end processor, the display is 1080p and there's no LTE version (yet) - then again, you wouldn't want to take this thing outside. 32GB of storage is supplemented by a microSD slot, and there's all manner of Wi-Fi compatibility on offer. In short, it's got a spec sheet, but not a great one. We also don't know the price yet, which is something of a worry. If this thing is hundreds of pounds / dollars, it's going to be a non-starter. If it's low cost, then it could be something decent to just have kicking around the house. I can't imagine that Samsung would be able to get away with giving this a high price, as the design isn't reminiscent of a top-end product. It's very plastic-heavy and, actually, just mass-heavy... you certainly wouldn't want to be picking this up all around the house on a frequent basis. The other odd thing about it is that it's not a tablet in some ways, as it's not something you can lay flat down. There's a kickstand on the back that snaps back and forth, allowing you to prop it up for easy viewing or lay it down and have some elevation for typing or tapping. I'm hoping this is removable, as there are going to be times when it gets in the way as it's fairly large. The overall design is, well, uninspiring. It's a hunk of plastic with a thin bezel and a Samsung logo - if it's got a lower cost, it'll be a great device. Put a large tag on it, and we're going to have problems. Let's get onto the screen, which is definitely something I was expecting to see a lot more from. Given the recent Samsung smartphones have QHD displays, seeing a Full HD option here is surprising to say the least - that is, unless we're going to get a rock-bottom price. The pixel count is OK, as it's going to be sharper than most of the TVs that grace our living rooms (unless you've recently plumped for a 4K marvel) but after using a few Samsung products of late I was expecting better. The icons all looks large and jagged, the video playback is uninspiring and it doesn't look like there's a Super AMOLED screen on offer here. In short, it feels very much like a budget tablet that's been supersized and had a kickstand bolted onto the back. It's nice to see that Samsung's not just decided to throw a generic Android interface on there - it's Lollipop, rather than Marshmallow (but seeing the latest OS would have actually been a surprise), but there's a little bit of difference. A grid system allows you to see all your TV and streaming services in one place, so you can play Netflix, YouTuve, Hulu, BBC iPlayer... take your pick, it's all here. 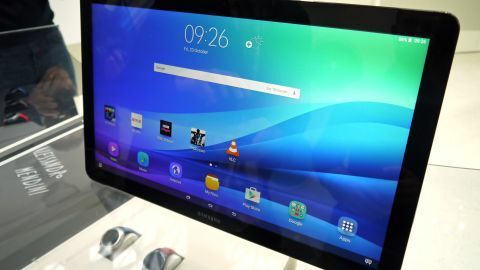 It feels a lot like the early attempts with the Tab Pro, which has a large grid-like system as Samsung tried to put its stamp on the enterprise space. It's fine, but I can't see it being any better than just having a folder of the icons - and in fairness to Samsung, you've got the choice for what happens when you hit the home button. Gaming is oddly decent on the Galaxy View, with the unnamed 1.6GHz octa-core processor seeming able to handle faster / frantic gaming. Samsung's touting the ability to connect up a Bluetooth controller easily and do some multiplayer action, but I've not really seen that pushed as a big thing for Android tablets yet. I can't see this being a big hit for Samsung, or why it's created it. The tablet market is slowing down, and I would have thought that the solution would have been to make more wide-ranging products rather than those designated for a certain niche. The Galaxy View is decent device simply because it's got Samsung's backing, and that's a brand that knows how to make good phones and tablets - but the spec list and worryingly absent price tag set warning alarms ringing. It's good that people are comparing this to the iPad Pro in terms of being a larger tablet, as there's quite a gap between the two. Do we need a separate tablet for family time? If we do, and Samsung offers this for a decent price, then perhaps it'll do OK sales-wise. If not, it'll probably sink without a trace.